OOO Gameprom, the makers of the popular Wild West Pinball, returns with another pinball adventure. 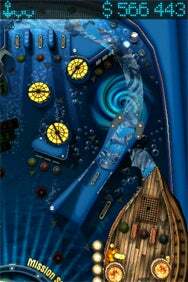 Deep Blue Sea: Just as Wild West Pinball adopts an old west setting, The Deep Pinball puts you in a watery underworld. In The Deep Pinball, you’re the captain of the world’s most advanced submarine that happens to be shaped exactly like a silver ball bearing. Your mission is to explore the watery underworld laid out on a table, hunting fierce creatures, racking up treasure, poking around sunken ships, and avoiding those treacherous spaces between bumpers and flippers that lead to an abyss of failure. The Deep Pinball is designed as a more or less traditional pinball table. The game sounds and looks—but does not quite feel—like a real pinball machine, down to the clicks and ringing bells a bumper makes when the ball strikes it. The game rewards accurate shooting, but is forgiving of slips. The narrow space between flippers makes it almost impossible to lose a ball down the middle. But the game is also stingy with extra balls, awarding one every 5 million points. That might not sound like a great feat, but that first 4,999,999 seems to take an awfully long time to rack up with this game. Although version 1.1 is an improvement from the original release, gameplay is still a bit rough around the edges. The camera movement, which zooms in and out on the ball, can be dodgy. The latest version lets players toggle between a dynamic and fixed camera view by pinching the screen. The best way to change the camera mode is by placing one finger in the upper-right corner of the screen and your thumb in the opposite corner. Some players have also complained about sticky flippers, but I haven’t had that problem. More annoying is the female computer voice constantly hectoring you to follow the checkpoints. She warns you not to flirt with her, but the more you play The Deep Pinball, the more you wish for voice mute option. The developer must have heard these complaints, because the latest version includes an option to turn the voices and music off and on. The sound and music preferences are located in your handheld’s settings. One more thing: Younger kids might not enjoy The Deep as much as older players, and it may not be appropriate for little ones in any case. My 7-year-old son doesn’t like The Deep Pinball as much as Monster Pinball, which is the exemplar of the pinball genre for the iPhone and iPod touch. He found The Deep Pinball slow going. More troubling, however, are some of the needless expletives the male voice exclaims whenever you lose a ball. I know that sailors are known for salty language, but this is ridiculous. Happily, with the new “voices off” option, you can eliminate the language altogether.